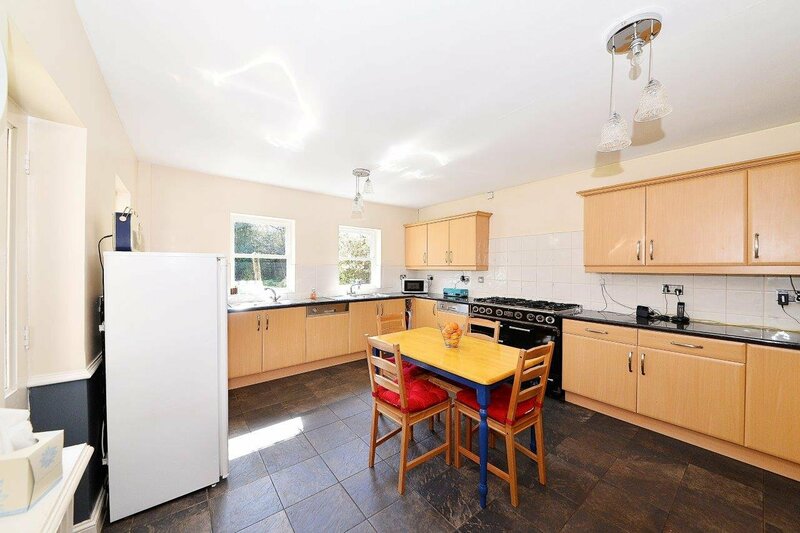 217A Bristol Road is a most interesting detached family home with a separate coach-house which is perfect for a growing family and more particularly to an extended family or someone with an au pair or living-in carer. Recently all the windows have been replaced and are all double-glazed. The accommodation is well maintained, it benefits hugely from natural light with most rooms having more than one window. 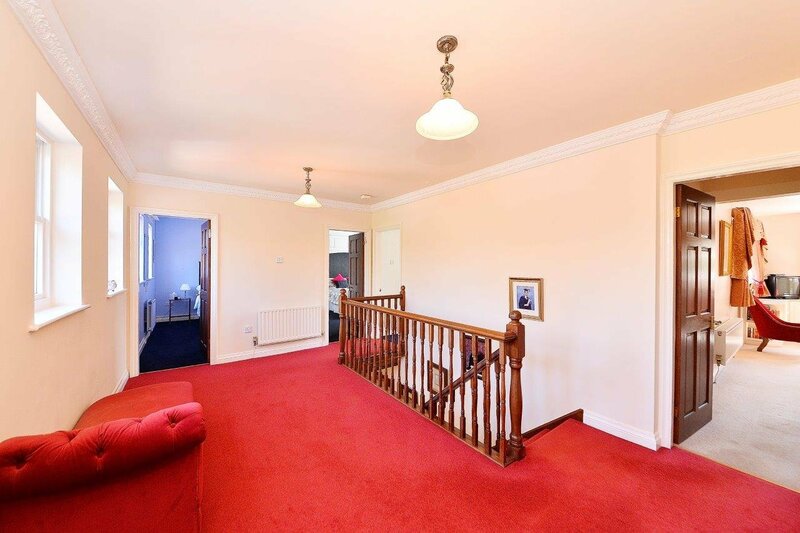 The ground floor accommodation includes l-shaped sitting room and dining room, large breakfast/kitchen, utility room, cloakroom, and garden room whilst the first floor has four double bedrooms, one with en-suite bathroom and family bathroom. The garden room allows access to the coach-house where there is a sitting room, kitchen, cloakroom, two bedrooms and bathroom. It also has a separate entrance from the driveway. 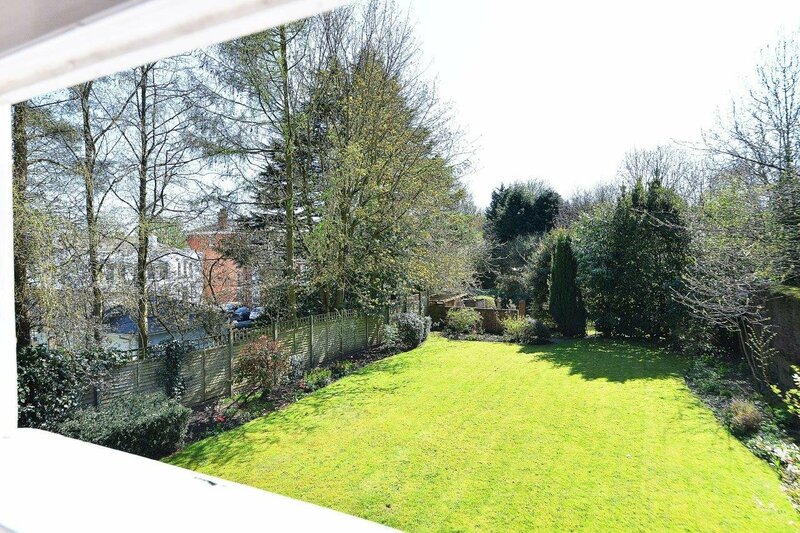 The property stands well back from the Bristol Road 120 metres up a private driveway shared with an adjoining property. 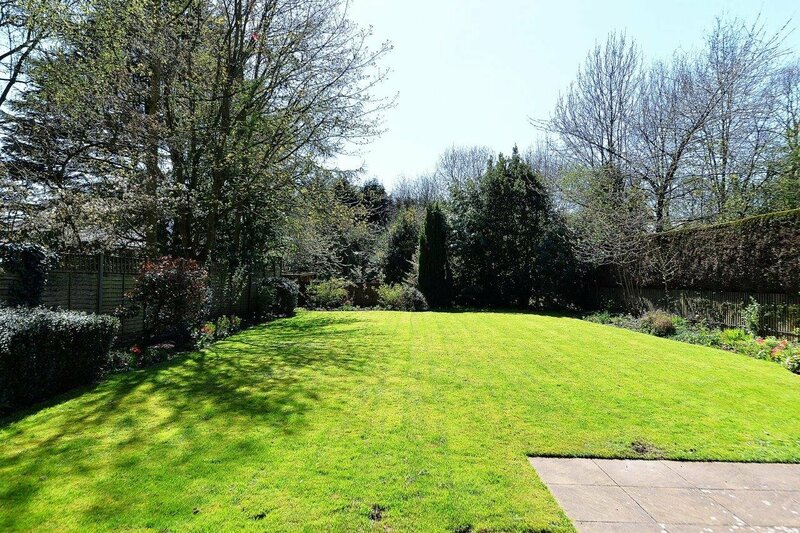 The grounds are extensive amounting to 0.3 acre and there is a double garage to the side and driveway parking. The location is very private and secluded and is totally peaceful. Situation Edgbaston is an exclusive suburb of Birmingham which is steeped in history and is part of one of England's largest urban conservation areas. 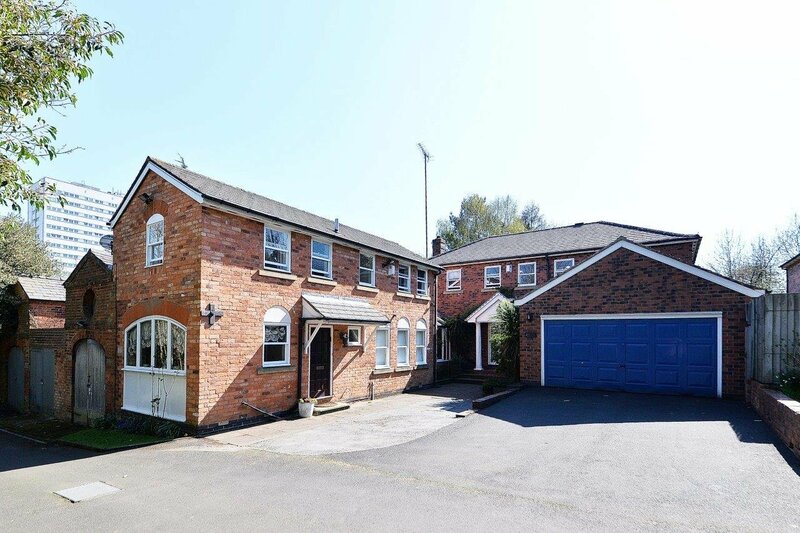 Much of Edgbaston comes under the control of the renowned Calthorpe Estate but 217A Bristol Road does not, but is very close to the boundary of the Estate and thus benefits indirectly. 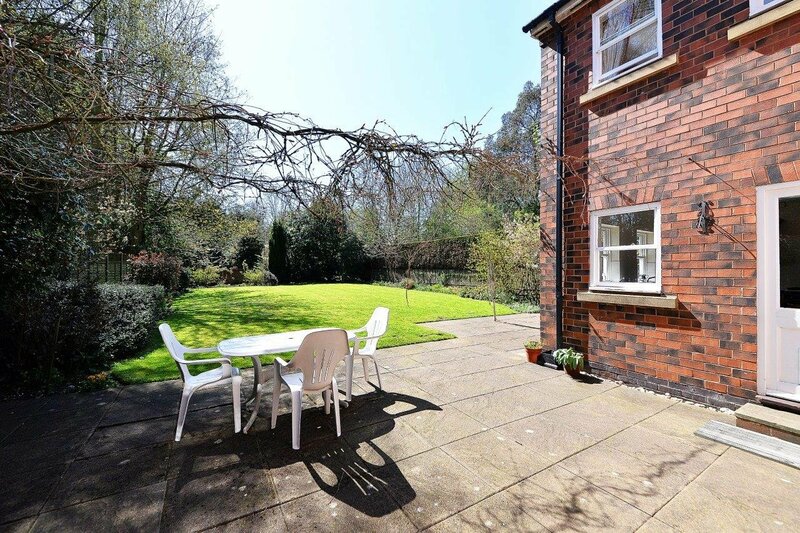 Ideally located for easy access into Birmingham City Centre which lies approximately a mile and a half away, Bristol Road is also well placed for providing excellent access to local amenities, shops and also all transport links for both road and rail. There is a marvellous range of schools in the area both in the state and private sectors. 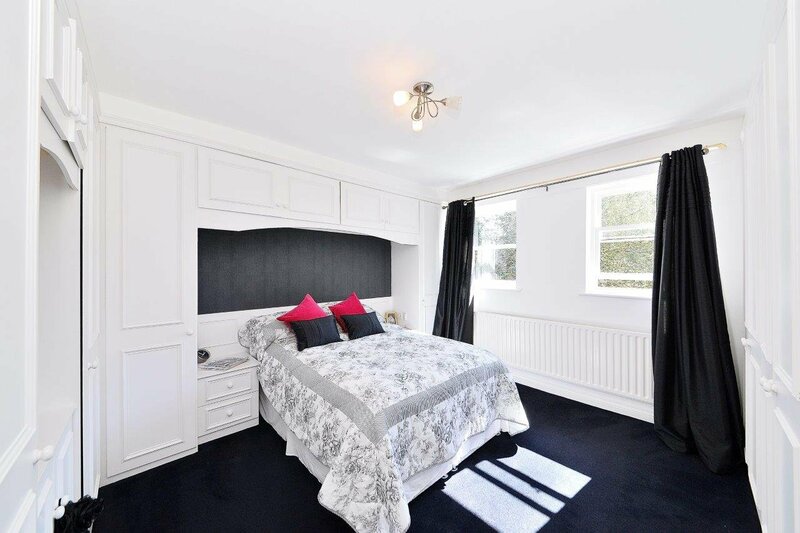 The property is very well placed for the King Edward Foundation Schools, where places are fiercely sought after. The choice of Preparatory Schools is wide and include Hallfield and West House, St George's, The Priory, Blue Coat Schools, and Edgbaston High School for Girls. Medical facilities are also excellent with the Queen Elizabeth delivering state of the art treatment, there is also the Women's Hospital, Children's Hospital in the city centre and the two private Edgbaston Nuffield and Priory Hospital ami. Sporting life is served by Edgbaston Golf Club, The Edgbaston Priory Tennis and Squash Club, Warwickshire County Cricket Club, The Archery Tennis Club and Harborne Hockey and Cricket Club. There are many parks in the area such as Cannon Hill, The Birmingham Botanical Gardens are nearby as is Winterbourne. The development of the area around the canal basin at Brindleyplace has done much to regenerate the area, The icc with its Symphony Hall, the nia, The Birmingham Repertory Theatre has done much to improve cultural life as has the re-modelling of the Birmingham Hippodrome, home to the Birmingham Royal Ballet. Shopping in the city centre has improved enormously with the opening of the Bullring Shopping Mall some years ago along with the Mailbox and more recently Grand Central. 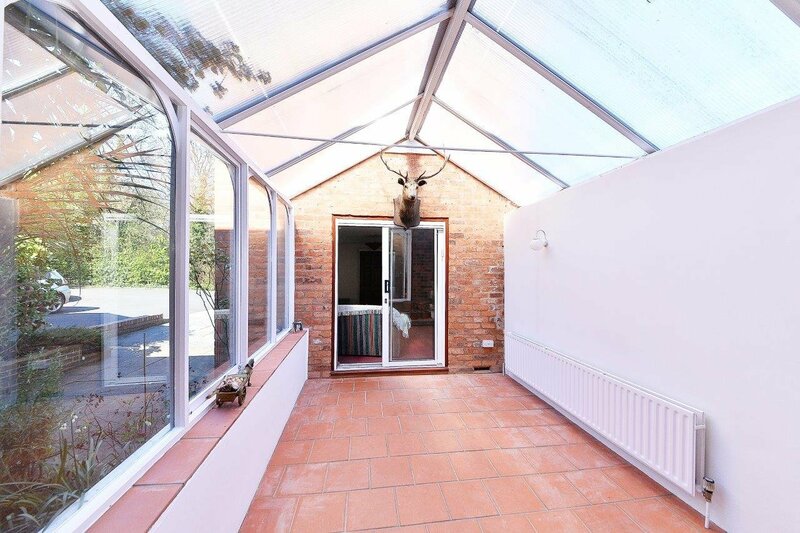 217A Bristol Road is an impressive family home which benefits greatly from a great deal of natural light. 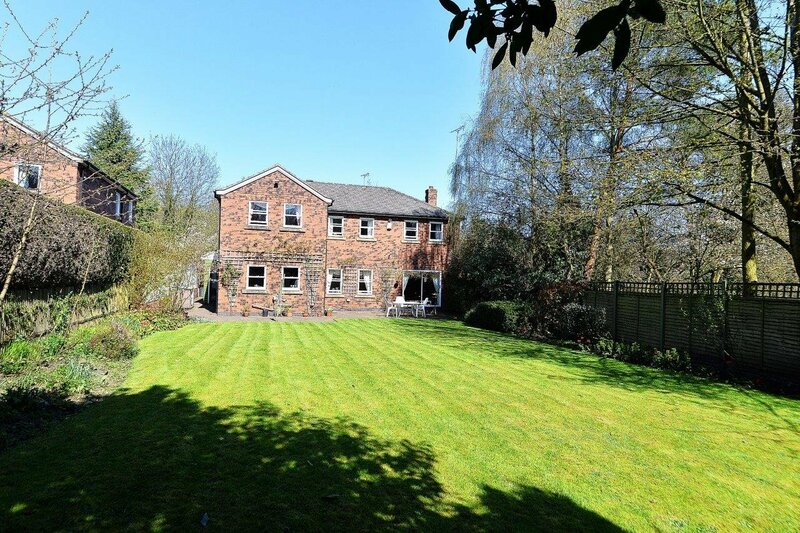 It is set within an impressive plot of land on an elevated position away from the hubbub of the Bristol Road A38. A private drive leads up to this house and its immediate neighbour at 217B, which is a smaller property. There is excellent parking on the driveway in addition to the large double garage. Reception Hall from which the staircase rises. 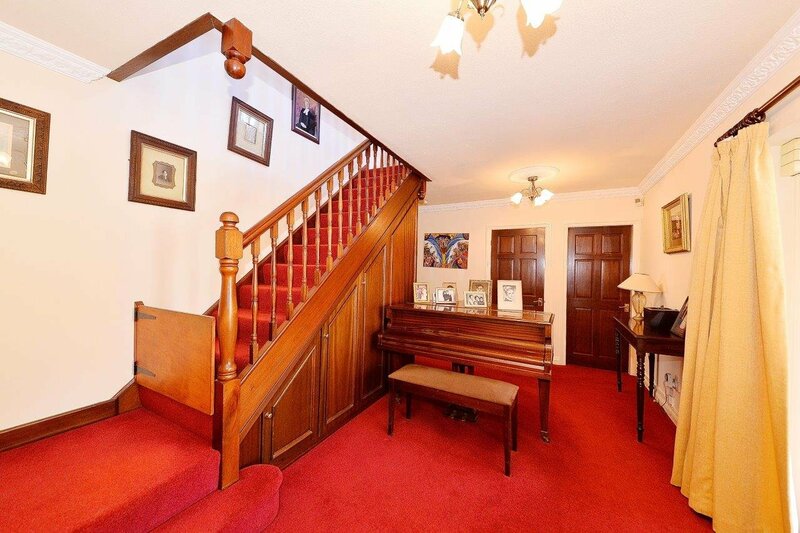 This is a generous area, indeed there is space for the current owner's baby grand piano which fits in well. 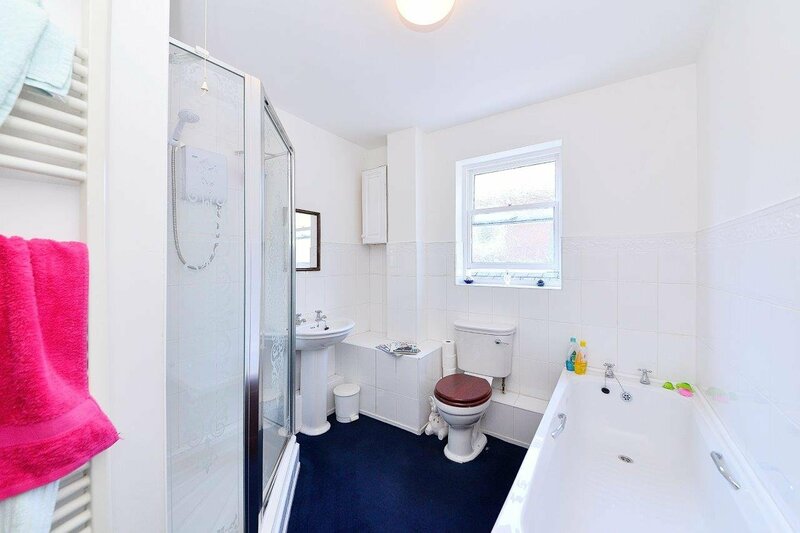 There is a cloaks cupboard with alarm pad, and door to the cloakroom with its low level w.C. And hand washbasin. The Sitting Room A spacious and bright room with sliding glass door onto the terrace and gardens. There is an attractive fireplace with living flame gas fire, coving to the ceiling and ceiling light point. 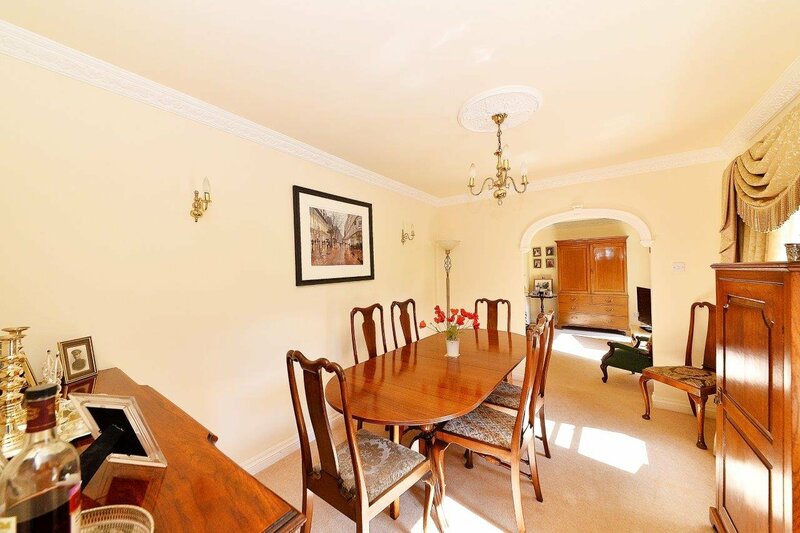 A large arch opens out into a formal dining room which is also light and airy as it has two windows onto the garden, coving to the ceiling and light point. 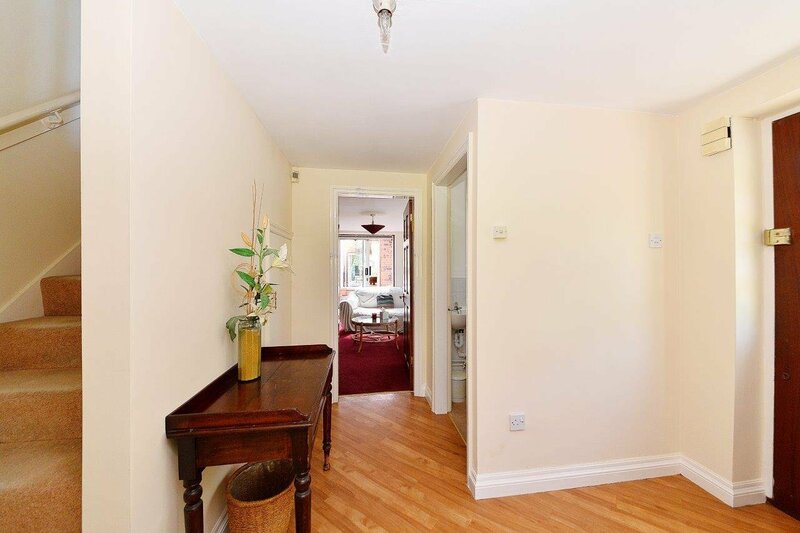 A door opens to the Breakfast/kitchen where there is also access to the utility room. The Kitchen area has stylish slate flooring, an extensive range of fitted units both base and wall mounted in a light wood colour. 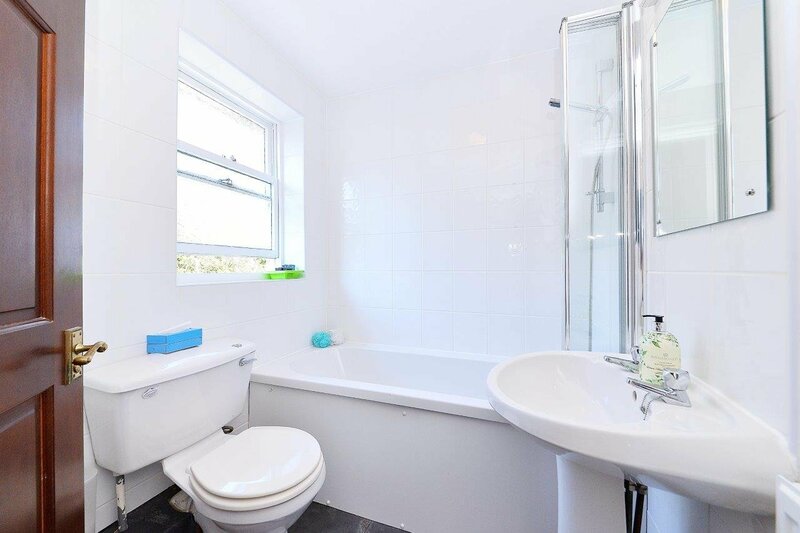 There is a door and window on to the side, two windows onto the garden beneath which are two separate sinks. 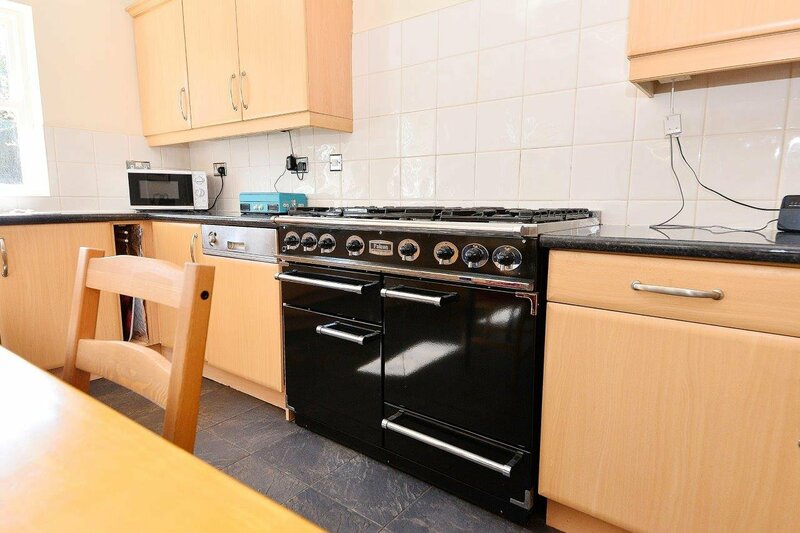 There is space for a large free standing fridge and freezer, space for dishwasher, a large gas cooker with hob, fitted shelving for cooker books and other such items and continuous black granite work surfaces. The Utility Room This has a door and window onto the covered passage leading to the garden and garages. 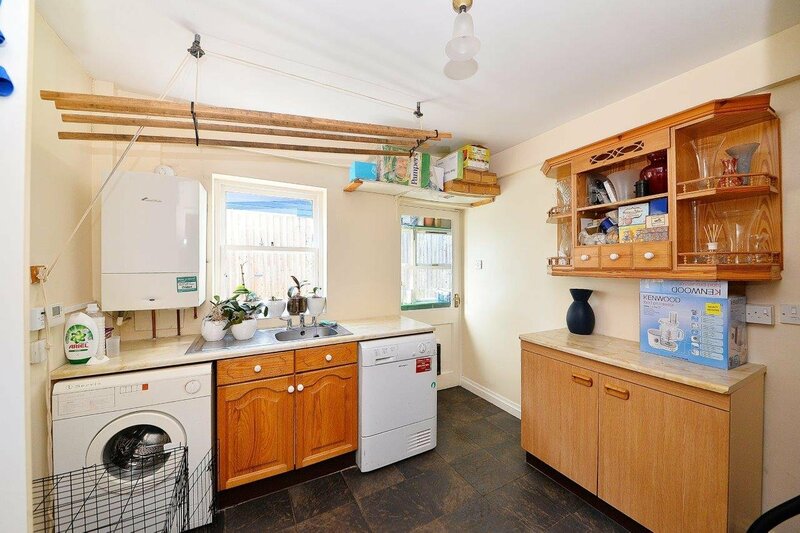 It has a sink unit, a wall-mounted boiler, and plumbing for washing machine and tumble dryer. 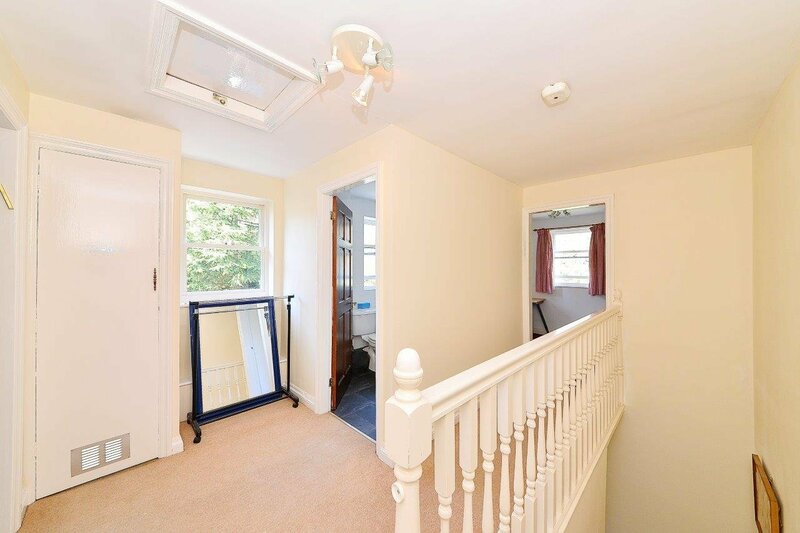 The First Floor also benefits from many windows and lots of light, the landing is spacious and light with a good sized airing cupboard. 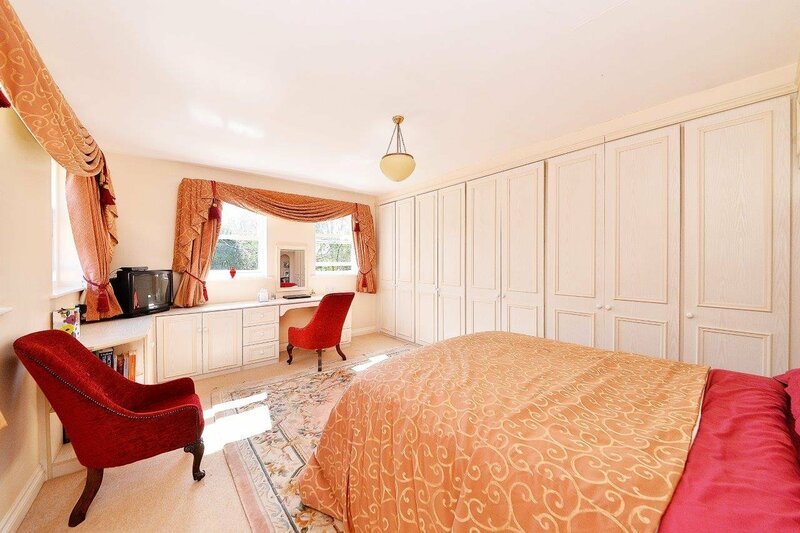 The Master Bedroom This has four windows and an extensive array of fitted furniture which includes wardrobes, dressing table, bedside tables and bonnet cupboards. 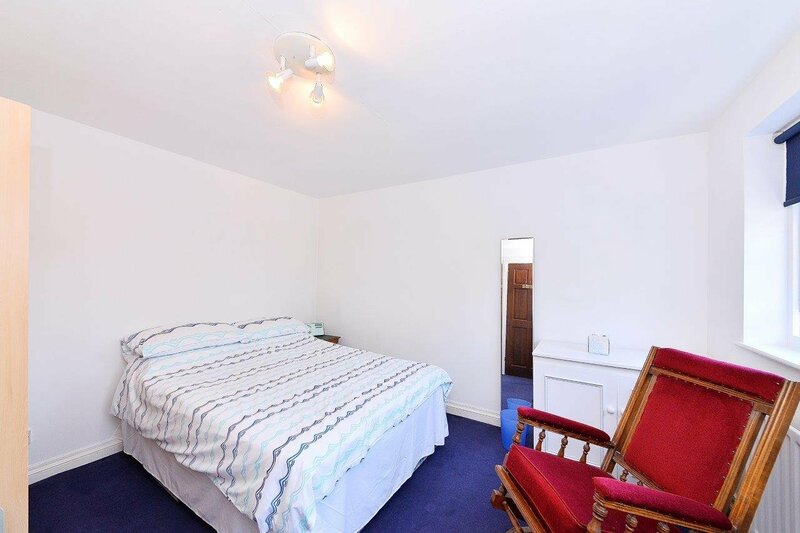 It enjoys a great amount of natural light and has a ceiling light point TV aerial and bedside lighting. 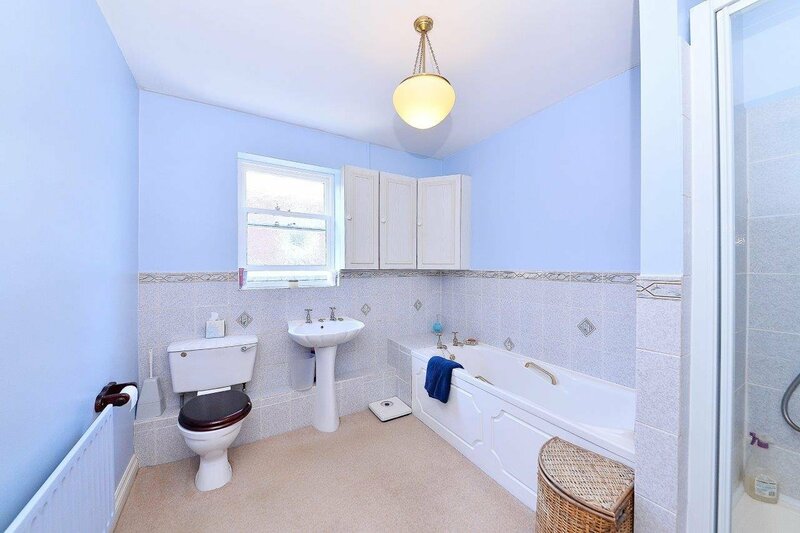 En-Suite Bathroom This has a white suite and is very spacious with bath, shower cubicle, low level w.C. And hand washbasin, the walls are tiled and there are fitted cupboards. Bedroom 2 A double room with ceiling light point and generous array of fitted furniture, both wardrobes and dressing table, TV aerial and bedside lighting. Bedroom 3 This is a double room with two windows, ceiling light point and fitted wardrobes. Bedroom 4 A pretty double room with two windows and ceiling light point. Family Bathroom Another generously proportioned room with white suite, bath, low level w.C., shower and hand washbasin, towel radiator. The Coach House This may be accessed from the garden room or through its own external door. Just as in the main house there is a great deal of natural light because of the number of windows here. 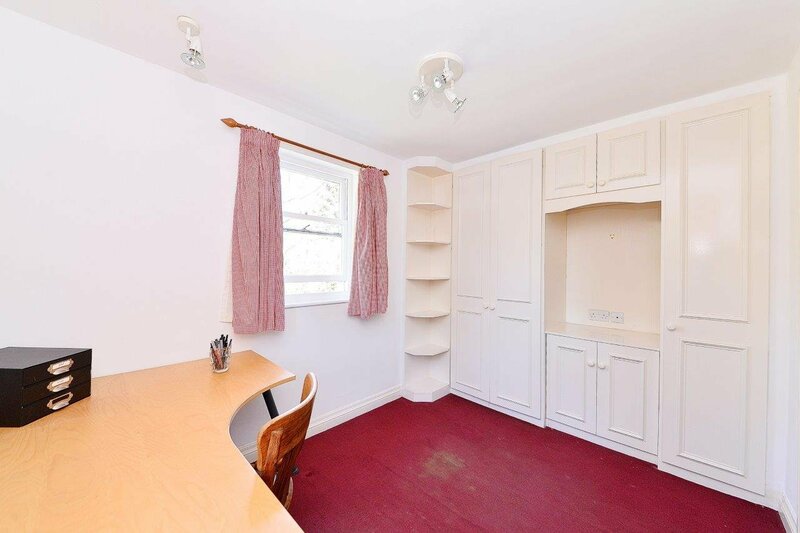 There is a sitting room with fitted shelving cupboards and drawers, including filing drawers. 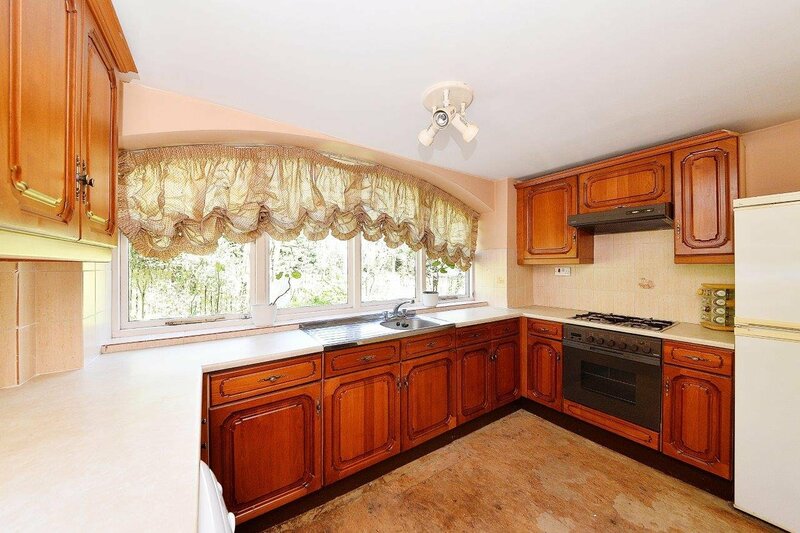 It also has a fully fitted and functioning kitchen, cloaks cupboard with alarm panel and ground floor cloakroom with low level w.C. And washbasin. 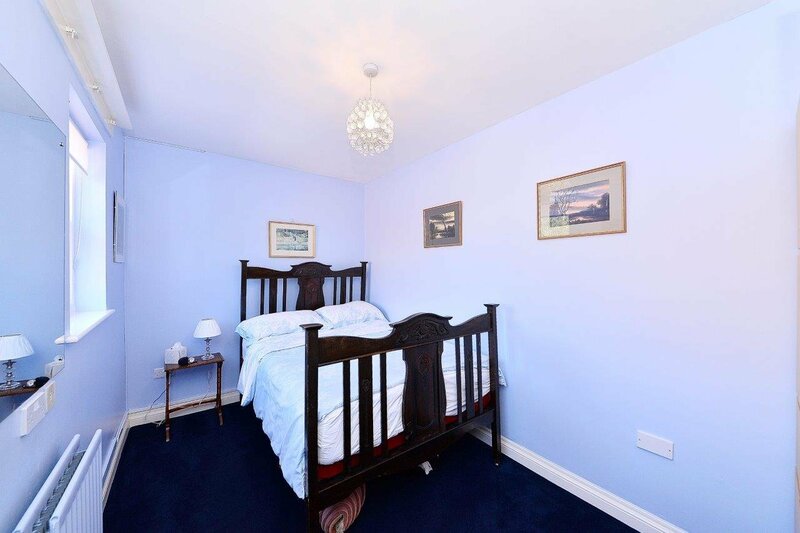 The first floor has a double bedroom, a further bedroom with fitted wardrobes and bathroom. The airing cupboard on the landing houses the central heating boiler. 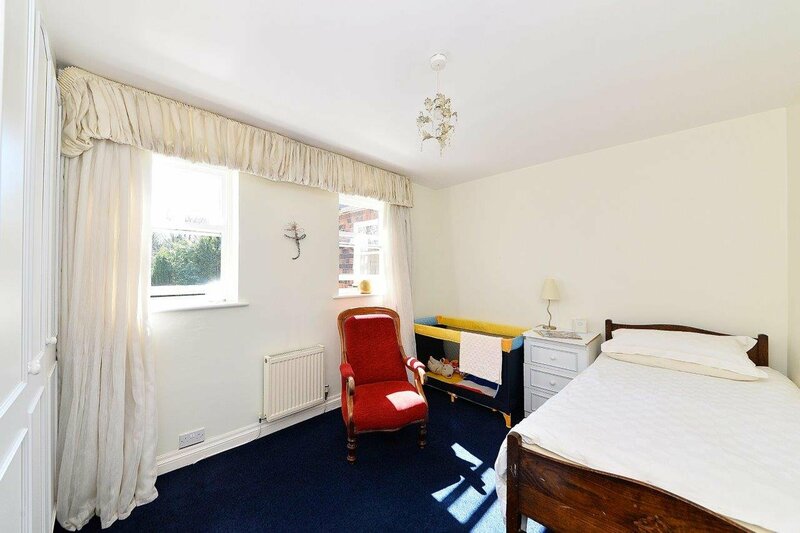 The accommodation is perfect for use as a granny flat /teenage wing or for an au pair or even medical/legal consulting suite. 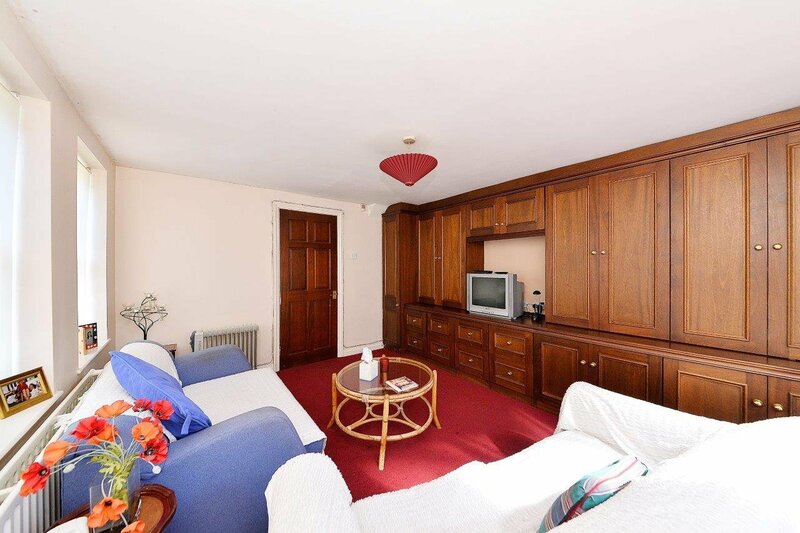 Outside There is a large double garage and plenty of parking at the front of the property. The garden itself is very generous in its size, it has mature trees, shrubs and has been landscaped well to provide plenty of interest throughout the year. General Information Tenure: The property is understood to be Freehold. The Agent has not checked the legal documents to verify the freehold status of the property. 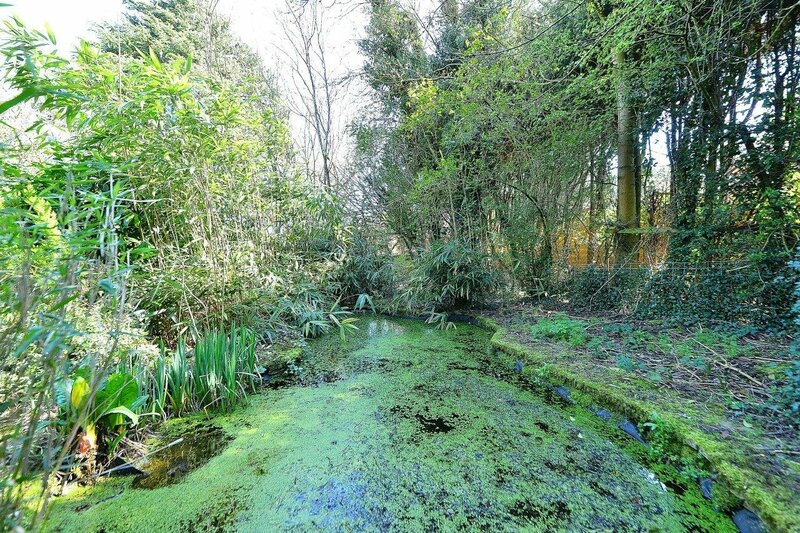 The buyer is advised to obtain verification from their Solicitor or Surveyor. 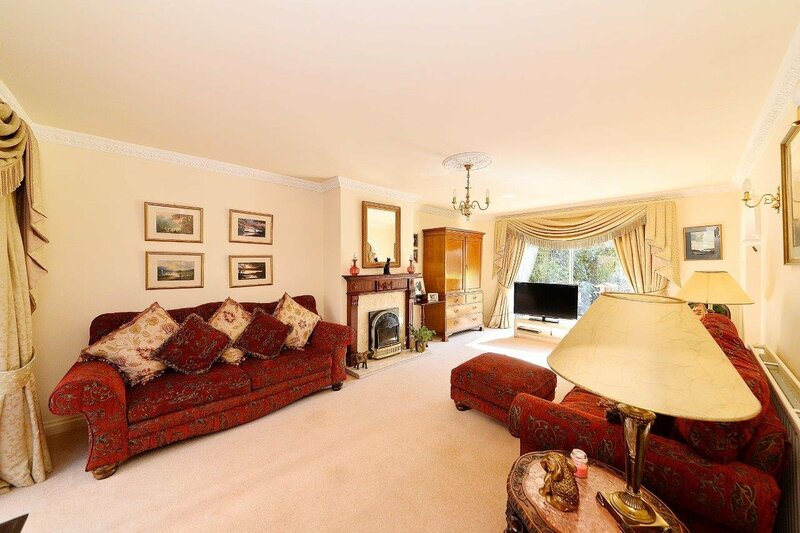 Viewing: Strictly by prior appointment with the Selling Agents: Robert Powell, 7 Church Road, Edgbaston, Birmingham B15 3SH. Regulated by RICS.